Arthur Hon, beverage director and sommelier at Sepia. And now he’s pouring out his passion (along with Ribera del Duero and Rueda wines, but more on that later) quite literally as Beverage Director at Sepia in Chicago, which is currently nominated for Best Wine Program in this year’s James Beard Foundation Awards. Hon has also been named Wine & Spirits’ Best New Sommelier for 2015 and Best Sommelier by Jean Banchet for 2014 (and also just passed his Advanced Sommelier exam) … you get the point — the guy knows his juice. Like the ink color for which it is named, the Michelin-starred Sepia is old-school in terms of design, but the menu is decidedly contemporary American. Chef Andrew Zimmerman’s training in French, Italian and Spanish cuisine is used as a starting point for adding new flavor components such as those from North Africa. I’ve always enjoyed Verdejo. It is a grape that straddles between Chardonnay and Sauvignon Blanc with muted herbal notes, like Sauvignon Blanc, but more texturally-driven, like Chardonnay. Beef tartare with egg yolk, horseradish, onion rings and multi-grain toast. The minimalist duck breast at Sepia. Beets with miso and burrata cheese. The bar room at Sepia in Chicago. Halibut, English peas, razor clams, semolina gnocchi and jowl-bacon with herb jus. The main dining room where Arthur Hon works his magic. Ora king salmon with asparagus, charred scallion relish and lemon. 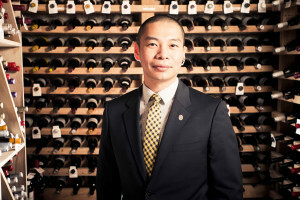 Arthur Hon, sommelier behind Sepia’s acclaimed wine list. Hon jokes that some might say Chicago has but two seasons — cold or warm — he truly relishes the springtime when there is an abundance of produce to work with (especially greens). I feel that it is my job to present guests with something they haven’t had before. But, “I don’t want to pigeon-hole Verdejo as being either Sauvignon Blanc or Chardonnay,” he says, noting that it’s its own thing and those are just familiar reference points. He describes the Naiades Rueda as being “a Burgundy-esque” style of Rueda. He is thrilled to be able to offer aged wines to his guests at affordable prices. Accordingly, all of the Ribera del Dueros on his list have some bottle age: Uvaguilera Palomero 2000, Arrocal Christina 2005, Alión 2007, Finca Villacreces 2009, Emilio Moro Malleolus 2009 and Áster Crianza 2010. And, nearly all of which are under $120 with several sub-$100 options – not bad considering the standard restaurant markup. The wine has been produced with the grapes coming from our 64 hectares of vineyards in our state by the banks of the Duero river. The blending combines 90% of Tinto Fino (Tempranillo) and 10% of Cabernet Sauvignon . The yields were particularly low for this 2005 vintage, less than 3000 kg/hectare. Deep purple colour. Complex nose, with intense aromas of mocha, graphite, wild cranberries and cassis. In the mouth it displays a meaty structure, with plenty of spicy dark berries, a good balance and an amazingly long finish. The tannins are well integrated, though will be better in 4-6 years. Drink up to 2027.